POLITICAL TIDBITS: White-haired, voice raspier and in wheel-chair, 84-year old Nene Pimentel steps up battle for Federalism, away from Imperial Manila, with key anti-dynasty provision and term limits in proposed constitution. Fellow Mindanaoan Ching Plaza seals more business through PEZA. White-haired, voice raspier and in wheel-chair, 84-year old Nene Pimentel steps up battle for Federalism, away from Imperial Manila, with key anti-dynasty provision and term limits in proposed constitution. Fellow Mindanaoan Ching Plaza seals more business through PEZA. 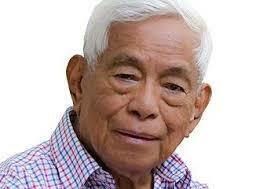 Former Senate President Aquilino Pimentel Jr., father of current Senate President Aquilino "Koko" Pimentel III, was jailed four times by President Marcos, so that the late Sen. Joker Arroyo termed him “the face of martial law---the poster boy of defiance to Marcos’ one-man rule." Nene Pimentel, now 84, has had a long political career that began when he was first elected mayor of Cagayan de Oro in the '70s. These days, however, despite his hair all silvery now, his raspy voice raspier, sporting a cane and at times wheel chair-bound due to weakening knees, the grand old man of Cagayan de Oro is still a rebel with a cause---and very clear-minded about it. Nene, founder of PDP-Laban which is now the administration party, is vigorously rebelling against "Imperial Manila." He has been clamoring for federalism and decentralization for decades now, and despite weakening knees, his resolve remains firm: to fight for more power in the hustings, away from Imperial Manila; institutionalize federalism, the anti-dynasty and term limit provisions via charter change. Cecile Alvarez and I interviewed Nene Pimentel and former Senator Heherson "Sonny" Alvarez---who were the oldest and the youngest members of the 1971 Constitutional Convention at the height of the Marcos era (Alvarez was among 12 upstarts in that Con-Con). In that assembly supposedly to draft a new constitution, Nene was already fighting for a shift to federalism. What made him a rabid federalism advocate? He narrated how as CDO mayor in the '70s, he detested the idea of having to ask Manila constantly for the mere salaries of his City Hall employees. In the Senate he worked hard for the passage in 1991 of the Local Government Code, which provided for the devolution of powers to the grassroots. Nene viewed the LGC also as the solution to the Muslim problem dating from Spanish colonial times. Sadly, however, Congress chose to devolve only three departments: namely, Agriculture, Health and the DSWD. Moreover, the LGC law provided for its review by Congress every five years, but Nene notes that this hasn't been done. He also observed that while DSWD was by law already devolved in structure and function through the LGC, yet, when Yolanda hit Eastern Visayas, DSWD Secretary Dinky Soliman was distributing aid funds from Manila---when it should have been the local officials who should have taken charge of these funds and relief. Nene Pimentel is clamoring for the drafting of a new charter to replace the 1987 Constitution, which will provide the meaningful shift to FEDERALISM. It would mean empowering the provinces to handle their own affairs, instead of over-concentrating power, especially over funds, in "Imperial Manila" and releasing it in trickles to favored partisans. A key provision in this new constitution, Nene stresses, should be the rejection of the political dynasties now found all over the country---perhaps in the case of as much as 60% or even of the members of Congress. To get at the heart of the prevailing dynasty system for so many generations now, he proposes two things: l). term limits confined to perhaps maximum of two terms, and 2). that relatives up to the 4th degree of consanguinity cannot run together. This latter restriction could be a tough point of contention, given the tenacity of our trapo politicians to cling to power, the poverty of the masses that makes them susceptible to bribes, and their lack of political awareness. But along with reform-minded Filipinos, I see the anti-dynasty provisions as the only way for our politics to be cleaned up and reformed. Most of our provinces have remained in the grip of dynasties. To really prosper and eliminate corruption at the local level---as well as the private armies of the dynasties in various provinces that coerce and terrorize plain folk--- power must be dispersed through Federalism. Nene's advocacy seems like a pipe dream, given the prevalence and power of dynasties. But it is time that we Filipinos look at this political set-up for what it is---a big source of corruption and mismanagement, and break its back. Nene sees the shift to federalism as the answer to the current over-centralization of power in Manila., and the primary tool for this new deal is the people empowered at the local level. It is media's responsibility to get this message across to patriotic Filipinos. so that they would adopt federalism and fight for it. The progress of our country depends a lot on this issue. Ching Plaza was quite aware of the big shoes she's filling when she was appointed by President Duterte as Director-General of the Philippine Export Zone Authority (PEZA). She succeeded long-time DG Lilia de Lima, who was awarded the Ramon Magsaysay Award for Government Service last year. But Ching---who holds the rank of brigadier-general in the AFP Reserve and is a consultant of the Defense Department---is a descendant of Lapu-Lapu: not the type to be intimidated. 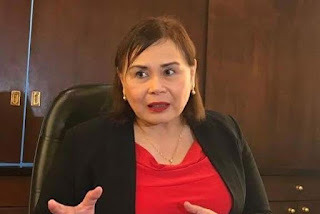 For one, she is familiar with the PEZA Law as she was one of its authors during one of her three terms in the House as representative from Agusan. With her familiarity with the law and her boundless energy---she was spewing ideas during our one-hour program, just like Mayon now is spewing lava---Ching intends to build on PEZA’s accomplishments as well as blaze new trails. Cecile Alvarez and I interviewed Ching recently over dzRH and she outlined her priorities. One is to “revolutionize” the PEZA program by establishing two economic zones (ecozones) per province and city as well as two public PEZA ecozones per region. Second, for easier dealings with investors, especially the foreigners, she intends to come up with the Philippine Economic Zones Map with locations nationwide clearly identified. Already there are 379 eco-zones under PEZA which are export-oriented and seek to encourage local capital and boost employment. Among Plaza's pet projects are medical tourism (the manufacture of medicines by international companies here and the establishment of more medical communities around the country for consultation and treatment of both Filipino and Asian patients); and more steel production here. 90% of our steel needs---down to the littlest nail---are imported from China, while, ironically, that country imports our iron ore as raw material. The logical question: why not build factories here for steel products, so that we lessen dependence on imports especially in the crucial construction industry, and we get to train our work force for high-end production? Toward that goal, Plaza intends to put up the “PEZA Institute” to train the manpower needs of industrial zones per region. She also plans to commence the greening of the various ecozones by means of “Green Industries"--- environment-friendly technology and zero-pollution. On June 18-19 this year, Ching Plaza intends to sponsor the "First Global Ecozones Convergence &; Exposition." Corollary to this is the strengthening of the infrastructure in our IT Parks, especially their internet facilities. I wish this dynamic manager lots of luck and success, as her triumph is the country's gain.